Password Manager XP is a convenient software application for storing passwords, access codes, social security and credit card numbers and other valuable information that needs protection. It will be your passwords and secrets keeper. Protect your private data with this password management utility. 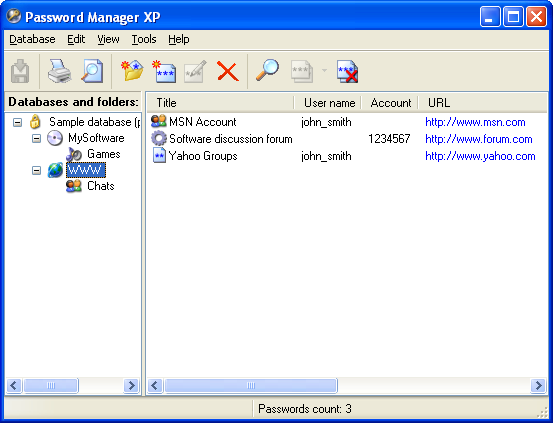 Password Manager XP comes with a built-in password generator and is fully integrated with Internet Explorer, works with external media drives (USB Flash), and comes with multiple export and printing options. The program is very easy to install and operate. It also comes with backup and restoring options and informs you about expired passwords. new: Internet Explorer integration on Windows 8. new: Firefox 10+, Opera 11.60+ support. updated: Better support for Windows 7. fixed: File attachments corruption in some case. updated: Improved the password generator.